Visit from the “Surpass!” students and instructors, March 31, 2015. This spring the Collections Department has been collaborating with our colleagues in the Frederick A.O. 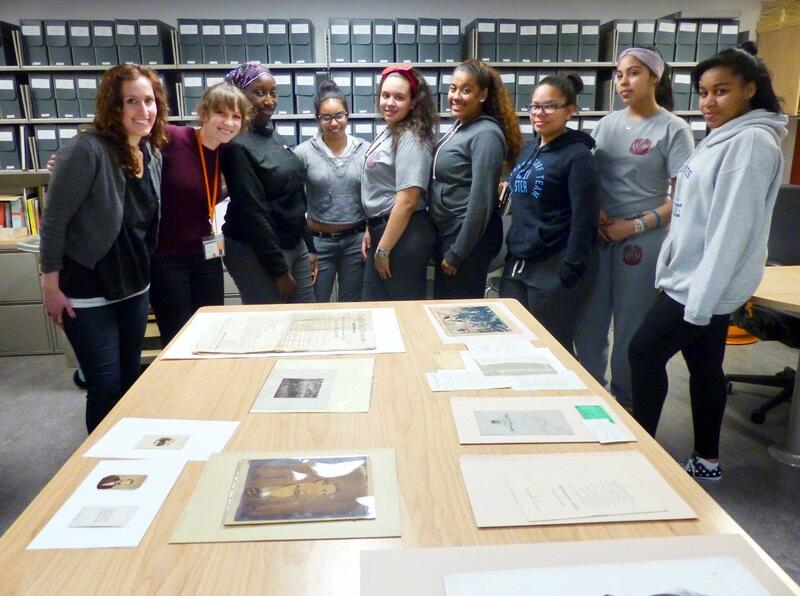 Schwarz Center to use archival material to support education programming. The City Museum developed Surpass! a unique program organized by educator Joanna Steinberg, to help at‐risk students in local neighborhood schools prepare for the Regents examination in U.S. History and Government. Last year the program helped 23 of its 27 students pass. Eight of the 23 successful students were seniors who had previously failed the exam, who have now graduated. 57 students enrolled this year from 12 high schools in East and Central Harlem, and the South Bronx. The program helps students improve their comprehension skills for answering document-based questions and multiple choice, and writing thematic essays. But the most enriching aspect of the course is that it includes multiple visits to Activist New York, to learn about social movements, and to the archive to view material related to key topics throughout U.S. history. On a recent visit, the students took a look at materials related to the American Civil War (1861-1865), which began when seven southern states seceded from the United States to form the Confederate States of America. As slavery was a major factor in the dispute between the northern Union states and the southern Confederate states, one topic we discussed was the role played by the United States Colored Troops in the Civil War. These units were largely made up of individuals who escaped slavery in the southern Confederate states following their emancipation by President Lincoln in 1862. 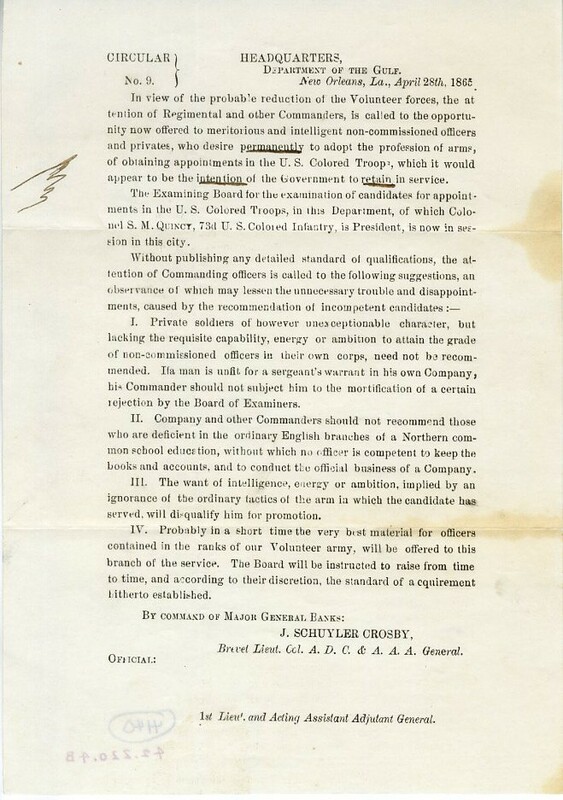 The Bureau of Colored Troops was established in May 1863, with the goal of recruiting former slaves and free blacks to enroll in the military and fight on the side of the Union. 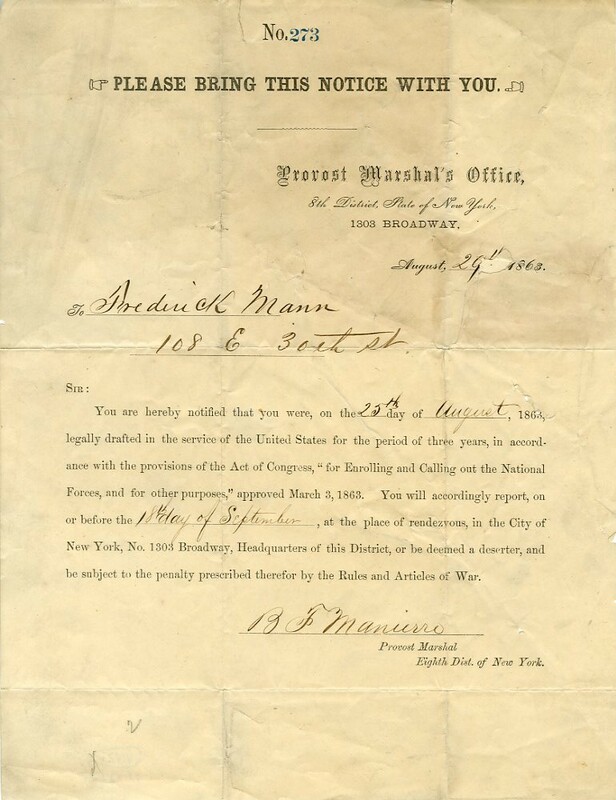 New Yorker Frederick Man (his name is spelled incorrectly on his draft notice above, as “Mann”) was drafted into the Union Army in August 1863, and became Captain of the 84th U.S. Colored Infantry, which was part of the Corps d’Afrique, a unit raised in New Orleans, Louisiana, following its occupation by Union Troops. Letter from Frederick Man to Albion P. Man, May 9, 1865, in the Letters Collection. 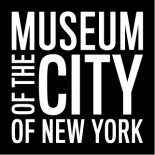 Museum of the City of New York, 42.220.52. CIRCULAR No. 9, 1865, in the Letters Collection. Museum of the City of New York, 42.220.4B. 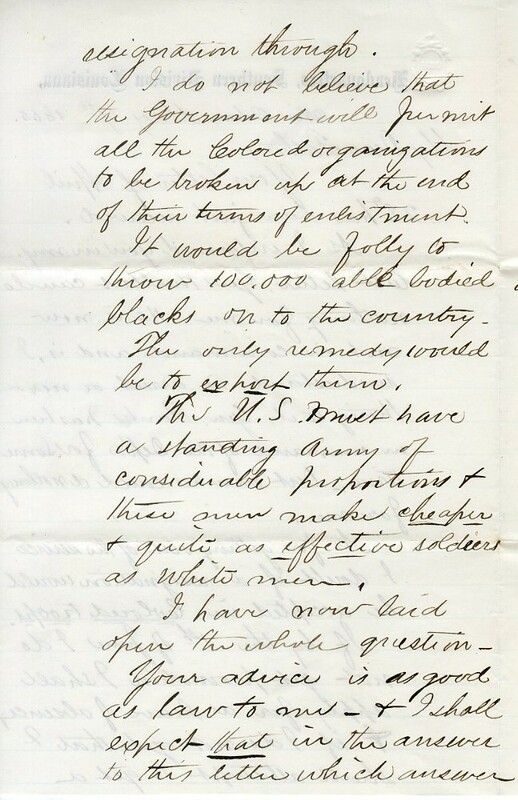 Other officials in the Union Army shared Man’s sentiments, and the circular to the left, dated April 28, 1865, sought permanent appointments to the United Stated Colored Troops, from the existing enlisted men. The United States Colored Troops were disbanded in the fall of 1865. However, for the first time, the Regular Army was authorized to raise two regiments of black cavalry, and four regiments of black infantry for permanent service. Though the armed forces were not fully integrated until 1954, following an executive order issued by President Harry S. Truman in 1948, this served as yet one more step on the road to civil rights set in motion by the Civil War and the abolition of slavery in the United States. 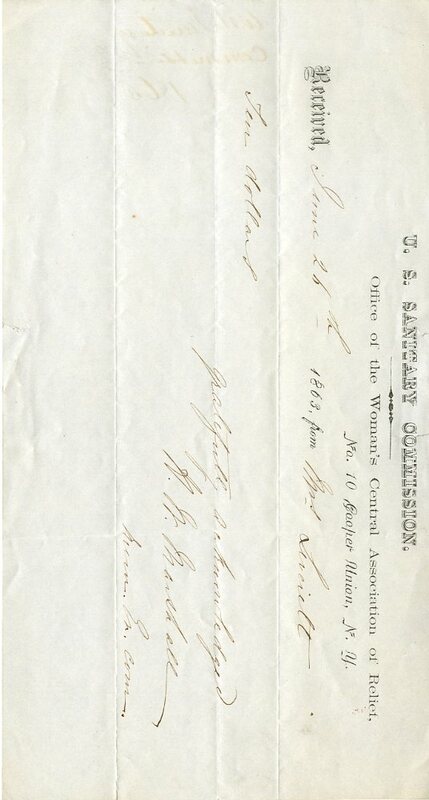 Receipt of donation to the U.S. Sanitary Commission, Office of the Women’s Central Association of Relief, 1863, in the Collection on the Civil War. Museum of the City of New York, 32.151.13. The visit from Surpass! also provided an excellent opportunity to share some of the ephemera related to the United States Sanitary Commission that we’ve been processing and preparing for digitization as part of a National Endowment for the Humanities grant*. The United States Sanitary Commission (USSC) was created by Congress during the Civil War to assist the Surgeon General of the US Army in caring for the sick and wounded soldiers and veterans. The Commission arose out of the Women’s Central Relief Association of New York, and volunteers raised an estimated $25 million dollars for the relief of the soldiers, volunteered as nurses, worked in kitchens, and sewed uniforms in addition to other tasks. 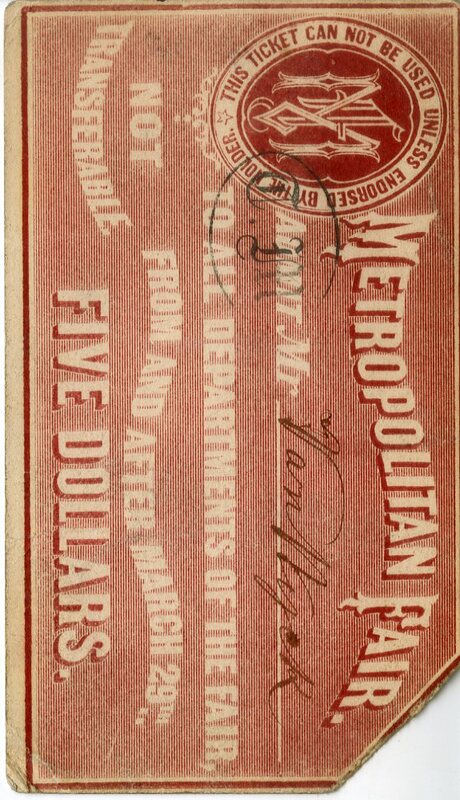 Admission Ticket to Metropolitan Fair, 1864, in the Collection on the Civil War. Museum of the City of New York, 36100.4. One way the USSC raised funds was through sanitary fairs, which charged admission for people to see exhibitions of scientific developments, art, and industry; provide opportunities to hear famous speakers and politicians speak; and see musical and theatrical performances. New York’s sanitary fair, referred to as the Metropolitan Fair, opened in March 1864, and buildings were erected in Union Square to house the exposition. In order to learn more about the USSC and Metropolitan Fair materials in the Museum’s collection, subscribe to our Catablog for Archival Collections – www.mcnycatablog.org – and you’ll receive an update whenever we post a new finding aid, including the one for the Collection on the American Civil War. Support for Surpass! The U.S. History Regents Preparation has been provided by The Rochlis Family Foundation, the Magowan Family Foundation, Inc., and the J & AR Foundation. *Any views, findings, conclusions, or recommendations expressed in this post do not necessarily represent those of the National Endowment for the Humanities. Amazing program Lindsay; sounds as if it is working! This entry was posted on May 12, 2015 by Lindsay Turley in Digital Project, Manuscripts and Ephemera and tagged 1860s, 19th century, 84th Regiment, Albion P. Man, American Civil War (1861-1865), Civil War, Draft, Frederick Man, Metropolitan Fair, Sanitary Fair, slavery, United Stated Colored Troops, United States Sanitary Commission.